Wood drying is necessary because it helps reduce moisture, extending its lifespan and hardening it for construction purposes. When the wood drying is done in a kiln, it is known as ‘kiln-dried lumber.’ It is well-known that log homes are built for energy efficiency and beauty, but to achieve both goals, logs need to be hand-cut and kiln dried so the moisture and minimized and the wood is stabilized to an acceptable level for use in structures. As you might have guessed, over-drying is a possible problem as much not drying the wood enough. 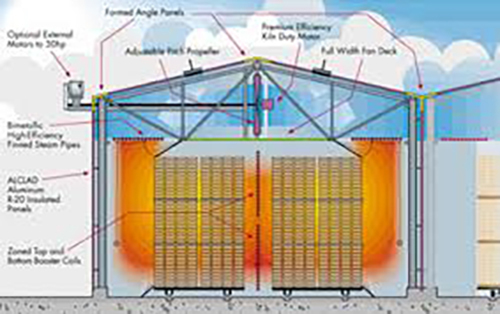 So how do you ensure the right amount of kiln drying is done to wood intended for construction? Great question; you use Kanomax instruments like the High-Temperature Anemometer (Model 6162). Logs are typically kiln dried for at least 30 days but could require a much longer or a much shorter amount of time, depending on the initial moisture content and inherent kiln conditions at that point in time. The kiln conditions can vary significantly, and it is crucial to monitor those conditions by using an anemometer that can handle the extreme temperatures typically found within kiln environments. Kiln drying is done by regulating temperature and humidity within the circulating air. The Model 6162 from Kanomax measures both simultaneously and removes any danger of damaging the probe or returning skewed readings due to extreme temperatures, because the probes are designed to perform in exactly that type of condition. Check out some of the specs and detailed information on the product below and continue reading about kiln drying at the bottom of the article. The 6162 High-Temperature Anemometer Measures Air Velocity and Temperature in Extreme, Volatile Environments! Including: Stacks, kilns, drying ovens, etc. How many points will you need to measure simultaneously? What is the temperature & velocity of the air you will be measuring? Are you going to attach the probe to the test environment? -At 932ºF, our High Temp probes can handle the HEAT!!! -Temperature compensation circuitry ensures accurate velocity measurements in rapidly fluctuating air stream temperatures. -RS232C interface, analog output and remote-control terminal equipped. -Store up to 999 measurements. Drying process can be defined as one where water is removed by evaporation from a solid or semi-solid or liquid. Industrial process uses different drying principles and temperature levels. One of the most common types of process uses air which is heated with steam, hot water or gas and then it is passed over the wet product. The air then picks up moisture from the wet product. Thus, energy and humidity increases which makes it a heat source. One of the basic drying processes is done by exhausting the humid air. A heat pump is used for extracting heat from the humid air. This extracted heat is then used for heating the dryer. Drying is generally used in food drying operations. It helps to expel moisture and retain other constituents which provide flavoring properties. There are different drying processes for raw materials according to their application areas. Drying is a reliable process and widely used. Industrial drying process uses belt dryers and tray dryers which enables the drying process to get a precise control of the drying procedure. In the industrial drying a hot air is used for removing moisture from the raw materials. This treatment helps the raw materials to get a long shelf life and does not require addition of preservatives. Spray drying process is used in different applications such as pharmaceuticals, plant extracts, soaps and detergents, beverages and textiles etc. Freeze drying is a slow process which is used in biochemical and pharmaceutical industries. Summary – Kiln drying process is done by regulating temperature and humidity of the circulating air. Drying process can be defined as one where water is removed by evaporation from a solid or semi-solid or liquid.